Download a reminder to make your voice heard on Tuesday, and stand with us to send a Sheriff to Washington, D.C. One quick click and you’re on your way! Make your voice heard today, and find your polling location here >> https://goo.gl/oPiKF! In the 1st Congressional District, Pinal County Sheriff Paul Babeu won a crowded Republican primary race and faces Democrat Tom O’Halleran of Sedona, who earlier served in the Legislature as a Republican. Ironically, Babeu’s Pinal political machine unraveled at the same time, as candidates he backed for county office lost. Babeu faces a tough battle in the Democratic-leaning district. We have opposed some of his actions in the past, but we endorse him because he would vote for Paul Ryan or another Republican for speaker instead of Nancy Pelosi. When she and the Democrats controlled the House, Obamacare and other ill-advised legislation was passed. For more, visit the Casa Grande Dispatch. We can’t afford to send Tax & Spend O’Halleran to serve us in Washington, D.C. It would just be more of the same broken promises, and wasteful spending. Check out my latest radio ad to learn more now! Watch now and let me know what you think. I hope you’ll help us spread the word by sharing them with your friends and family today! Pinal County Sheriff Paul Babeu has won the Republican primary to fill an Arizona congressional seat being vacated by U.S. Rep. Ann Kirkpatrick, D-Ariz.
Kirkpatrick is challenging John McCain for his Senate seat. Babeu beat Wendy Rogers, Gary Kiehne and Ken Bennett in the GOP primary. Babeu said he would fight to keep coal-fired power stations in Arizona open to keep jobs in northern Arizona and energy costs low. Environmentalists and the Obama administration have pushed for tighter emissions controls at coal plants. That includes the Navajo Generating Station in the far northern part of the state. Babeu told KTVK-TV Channel 3 coal would be a central issue to his November campaign. Babeu faces former state lawmaker Tom O’Halleran, a former Republican turned Democrat, in November. The First Congressional District includes much of northern Arizona, including the Navajo Nation and Flagstaff as well as Globe, Miami and Pinal County. 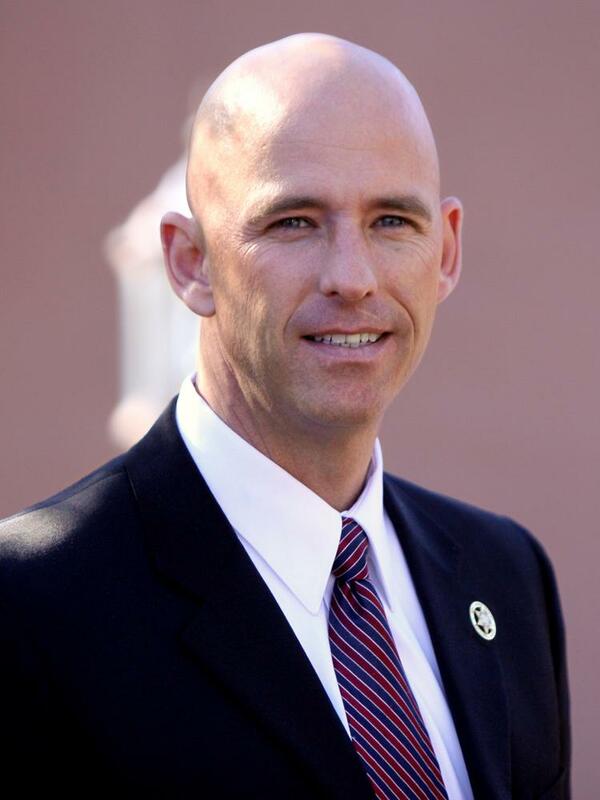 Babeu has received some national attention for dealing with illegal immigration and drug cartels. Pinal County is in between Tucson and Phoenix. The district is as large as some states and could receive national attention from both political parties, business groups and environmentalists. To many it may seem like our nation is in dark times, but with the right leaders, we can make America strong and safe again. Former Arizona Governor Jan Brewer is one of those people. A firebrand who stood up to President Obama and was the architect of Arizona’s economic comeback. She’s not to be messed with. Now, she has endorsed Sherrif Babeu for Congress. He has the momentum and support and now he needs to close strong to win the primary on August 30 and begin the fight for victory in November. Thank you Governor Brewer for being on Babeu’s team. CASA GRANDE, Ariz. – Pinal County Sheriff Paul Babeu garnered the vaunted “Young Guns” designation from the National Republican Congressional Committee. Babeu, the leading candidate in the GOP primary in Congressional District 1, achieved the “On the Radar” designation Friday after several quarters of strong fundraising. Recent polling shows Babeu with a commanding lead for the GOP nomination. CD1 is one of the most competitive districts in the nation and attracts significant spending from both Republicans and Democrats. CD1 represents one of the best districts in the country to turn from Democrat to Republican. It is important to work closely with the NRCC to help elect a conservative Republican that values limited government with strong national security credentials,” Babeu said. Babeu is a veteran of the Iraq War and spent 20 years in the Army National Guard, rising to the rank of major. In addition, Babeu commanded 700 troops on the Arizona-Mexico border as part of Operation Jump Start, which helped reduce illegal immigration and drug smuggling by 94 percent in the Yuma Sector. He was first elected Pinal County Sheriff in 2008 and won reelection in 2012. Casa Grande, AZ – State Sen. Carlyle Begay announced yesterday he is throwing his support behind Pinal County Sheriff Paul Babeu in the race for the 1st Congressional District. Begay, a Republican from Kayenta, decided to leave the race and endorse Babeu because of the sheriff’s strong support for law enforcement, national security issues and instilling fiscal sanity in Congress. Begay won wide praise last year when he switched from a Democrat to a Republican. He has sought to improve conditions in his district, winning money for important projects on and near the reservations. Babeu praised Begay’s service to the residents of northeastern Arizona. Begay said he will spend the next few months helping Babeu win the GOP primary and then the general election. Less than two months before Republicans select a congressional nominee in Arizona’s open 1st District, a just-completed survey shows Pinal County Sheriff Paul Babeu — by far one of the most unique GOP contenders for Congress anywhere in the U.S. — topping the seven-candidate primary field with 40 per cent of the vote. The race is being watched by national leaders in both parties as well as the national media. With incumbent Democrat Ann Kirkpatrick relinquishing her seat to challenge Republican Sen. John McCain, the very marginal Democratic-leaning 1st District is one of a handful nationwide that could “flip” to Republican this fall. But the other reason for the growing attention on Arizona-1 is Babeu himself— a lawman and border hard-liner who has become a national hero to many conservatives. In 2012, the National Sheriff’s Association named Babeu National Sheriff of the Year. Babeu, a pro-lifer, former U.S. Army Reserve major, and a stalwart conservative also is gay. “All of my friends and family knew it, and, although I never went around and advertised it, it was one of the worst-kept secrets in the county when I ran for sheriff,” Babeu told Newsmax. Babeu has been elected twice in landslide wins in his home county and says his popularity will help him win this up-for-grabs seat. He is now seeking nomination for Congress in the primarily rural 1s tDistrict, which is larger than New York State and home to the largest concentration of American Indians (22 percent) of any congressional district in the U.S. In a district that suffers an extreme impact from the porous U.S-Mexican border, Babeu is frequently asked—not surprisingly–about his stand on border security. “We’ve got to secure our border in order to stop the onslaught of crime, period” he said, recalling how he oversaw the “Pipeline Express” operation that became the largest drug bust along the border. He also noted that the efforts of his department along the border led to the capture of 21 drug cartel scouts and 108 firearms linked to the notorious Guzman gang of Mexico. The new OH Predictive Insights poll (conducted for Babeu’s campaign) showed the sheriff leading the GOP field with 40 percent of the vote, followed by former Arizona Secretary of State and gubernatorial hopeful Ken Bennett with 11 percent, rancher and past U.S. House hopeful Gary Kiehne 10 percent, and four other candidates at 3 percent and below. The winner of the primary will almost surely face Republican-turned-Democrat Tom 0’Halleran, a former state legislator and ally of former Democratic Gov. Janet Napolitano. State and national GOP operatives have high hopes of picking up the 1st District, pointing out that both Mitt Romney and Arizona Gov. Doug Ducey carried the district in ’12 and ’14 respectively. Inevitably, questions about the tragedy in Orlando, Florida and resulting comments from the White House about Republicans not caring about gay Americans are posed to Babeu. Casa Grande, AZ – Former Arizona House Speaker Andy Tobin, the 2014 GOP nominee for Congressional District 1 and now an Arizona Corporation Commission member, endorsed Pinal County Sheriff Paul Babeu for the open House seat. Tobin, the former House speaker, narrowly lost his 2014 race during a hard-fought contest. However, he continued his public service in the Ducey Administration and now after his appointment to the Corporation Commission, where he specializes in representing rural Arizona. Babeu, the two-term Pinal County sheriff, praised Tobin’s commitment to Arizona residents and thanked him for the support.